I love it because it helps metabolise stored body fat laid down when your fatty (bad) estrogen dominates. Loved by fitness models as a healthy way to strip fat! I choose Nature’s Way – available on Amazon. This is a typical story from a regular user of DIM Plus. …. When I was in my late thirties, I started going through all the hormonal changes that a lot of women start to experience. For me though, the symptoms were exacerbated. I experienced heavy menstrual bleeding, acne, mood swings, sleeplessness, hot flashes, you name it. In other words, I was one hot mess. I tried every remedy that was out there, including the bio-identical hormone therapy. That worked for a while, but it quickly became something that I couldn’t financially afford anymore. So, I found myself back at square one. 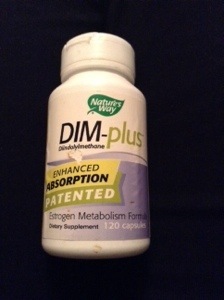 Then one day, I was told about this all natural remedy called DIM PLUS by Nature’s Way. I had never heard of anything like this before. It’s an estrogen metabolizer that’s made up of all of these cruciferous vegetables combined together in one pill. It’s supposed to get rid of the bad estrogen and help with some of the symptoms I was having . I didn’t even know I had bad estrogen in my body. So, I thought I would give it a shot. I took the pills as directed. What happened next was absolutely astonishing. Within 2 months my menstrual cycle flow was reduced by over half. I no longer suffered from the extreme fatigue from losing so much blood every month. My acne cleared up, and I started feeling like my old self again. There were absolutely no bad side effects from taking this. I highly recommend Nature’s Way DIM PLUS for any woman who is going through the perils of perimenopause. It’s the best $20 a month that you will ever spend. Try it – it packs the punch of kilo’s of veg in a couple of easy to swallow caplets daily. This entry was posted in Fat Loss, Healthy Eating, LifeStyle and tagged body fat, cruciate, DIM, estrogen, Fat loss, hot flushes, menopause, vegetables, weight loss. Bookmark the permalink.